I love how three or four times a year we attempt to mobilize our whole church to serve our community. Whether it’s through relief work after a major storm or doing an “extreme makeover” of a local soup kitchen in 24 hours … these have been some the proudest days of my entire life. These are a lot of work to pull off … but I wish more churches would experience the benefits that come from serving together like this. Out of Your Seats … // I love seeing our church get out of our seats and onto the streets. Something magical happens when we get out from behind the walls of our services and into the community. Events like this force us to directly engage with the public we are attempting to reach … not just on the day of the event but in the months leading up through the prep. It moves us from “come and see” to “go and show”. Different Leaders // Every time we do these sorts of events it’s fun to watch a different set of leaders step up and help.There are people that will give themselves to a large project like this that is time bound that aren’t interested (or available) to serve on a normal serving rotation. These leaders have added so much to the life of church … we’d be missing out without them. Good Thing vs. God Thing // There is a segment of people who will engage with us on community events like this that won’t connect with us through our normal Sunday Services. In fact, we’ll have hundreds of first time guests participate in these events in one way or another … way more than any really cool series. It’s not lost on me that these large scale community service events seem to be amazing first exposure and front door experiences for new people to our church. Fights Against Organizational Silos // As we grow as a church I have an increasing concern about the silos that are naturally starting to build. Each of our various departments starts to gain it’s own culture and approach to leadership that is necessary to build momentum in any given area. Some of this siloing is inevitable with a growing organization. Mass outreaches force people from across the organization to work together on tangible outcomes and break down some of these silos. Church is Fun. // Each of these events seems to end up with us throwing a party for the city we’re hosting in. Although the 5k was the focus of this day there was an after party with live music, tonnes of free food, face painting and fun for the kids, bounce house and even a little dancing. There is something right (and maybe even prophetic) about the church throwing a party for the community. Cause Bigger Than Our Church. // 1 in 9 people in the world don’t have access to clean drinking water. As a church we are committed to working towards bringing water to some of the world’s poorest people. We asked our people to get sponsors for them to run or walk in this event. In the end our people raised $115,000 for the clean water cause! Amazing! Our finance team is still working on the numbers … but the vast majority (70-80%) of those donors are brand new to us … meaning we’re engaging new people in the mission. Rallying our people to engage in a cause in a larger than our local church reminds our people we’re a part of broader body of Christ. It’s Worship // The church mobilized on mass to sacrifice for the cause of Christ to support other people … if that’s not worship I don’t what is. We often talk about the fact that “worship isn’t just singing on Sunday mornings” but these events are tangible other centered living and give us a another glimpse of what worship is. Actual Cross Generational Ministry // So much of the ministry we do is “age segregated” and I’m not convinced that’s the best for anyone. [More on the benefits of cross generational ministry.] These events are designed to available to and work with people across the generations. It’s one of the few times as a church we gather together a whole regardless of our age or stage. The challenge of programming for the entire age spectrum of our people creates new and wonderful connections that don’t normally happen. Generates All Kinds of Positive Buzz // These events generate a bunch of measurable communication buzz when we do them. Sharable Social Content // Part of the reason I was pumped about the “SuperHero” theme for this event was I knew it would generate huge shares on our social channels after the event. People love seeing fun and goofy things online. The sight of 2,000 people dressed up in costumes for a good cause generated huge interest! As an example … this one Facebook album generated over 8,000 views alone. Foyer Buzz // After these events we see a bump in the attendance of our Sunday morning services. More than just the number of people who show up, there is a tangible excitement at our services as people talk about what happened at the event. New relationships are kindled and that spills over into our normal Sunday environments. 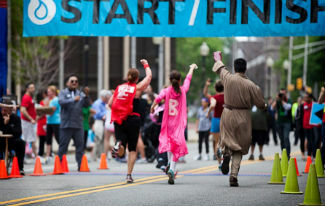 I’d love to hear about your experience with a mass mobilization effort like the SuperHero 5k. What impacts have you seen on your church or community through doing something like this? Great stuff here Rich – especially number 7 – “It’s worship”. Too often it’s easy for “church people” to define worship as the 20 minutes of music at the start of a service, but as you point out, worship is SO much more than this. At my worship blog – http://www.MoreThan20Minutes.com – I define worship as anything we do that turns our focus on to God … and serving people in need certainly falls into that category. I wonder how our churches would grow and change if we saw worship as more than just a genre of music? I appreciate the links to this article as well as your comments here. I was checking out your blog and I noticed that on the first page there are 28 posts and only three or four of them are not explicitly about musical worship. I’d love your thoughts on how we encourage people to worship more than just singing on Sunday morning. More than 20 minutes as you said! Thanks again! These are some great benefits to holding a BIG Splash event! Great job! At 217church we are experimenting for a season with the approach to actually AVOID the BIG splash events and mobilize all 18 of our groups into their own LITTLE SPLASH events that connect people into smaller communities where they can be discipled and get more healthy. We are finding our people have limited energy. We are trying to figure out the balance but it is definitely time for another BIG EVENT. Thanks for this encouragement!